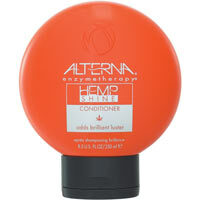 Alterna Hemp Seed Conditioner brightens, add luster and manageability to any hair type. Alterna Hemp Shine Conditioner is infused with sweet orange peel extract, bathing the hair in vitamin C, a natural anti-oxidant that protects against damage and dullness. The patented ultra-hydrating hemp seed oil and nutrient-activating enzymetherapy complex help restore hair's natural brilliance and improve manageability. Fruit derived enzymes and powerful UV protectants work together to provide maximum color protection. Ideal for daily use. Benefits: Strengthens hair with a protein/moisture balance. Gently conditions while adding shine. For use on normal, dull hair. Directions For Use: Cleanse hair with Alterna's Hemp Shine Shampoo. Rinse and apply conditioner. Massage through hair and leave on for 2-3 minutes, then rinse. Use daily for maximum shine.